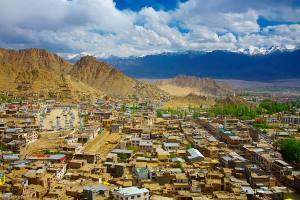 Located on the Leh Manali highway this monastery is at a distance of 20 KM from Leh town. 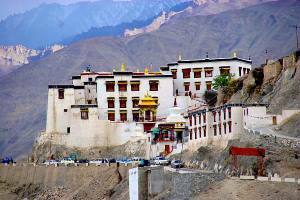 On the way to this monastery you can see Sindhu Darshan, Shey Palace and Rancho School. 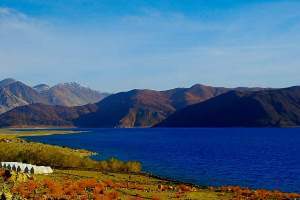 You can visit Monastery first and on return visit these places. 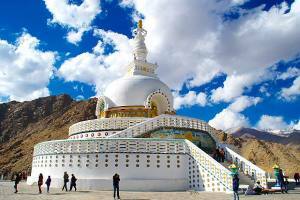 If you are coming from Manali side then this Monastery will be at your right side before Leh town. 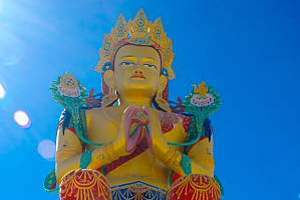 There is a Maitreya Status ( statue of future Buddha ) , this 12 meter ( 40 ft ) high status took three years to build, with 30 people working continuously. It is made of clay and terracotta brick painted with gold. The murals behind the statue tell the story of the future Buddha. On the right side opposite the door are paintings of Thiksey Rinpoche's lineage. 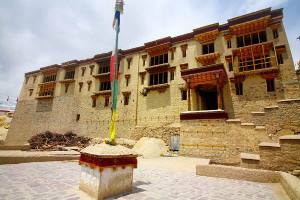 On the east side ( the wall facing the statue ), is a panel showing from left Dum Tonpa, Atisha, Legpai Sherab , Ling Rinpoche, 10th Panchen Rinpoche, HH 14th Dalai Lama, Trichang Rinpoche, Kachen Lobzang Zotpa Je Tsongkhapa and hist two chief displies, Gyaltseb Jhe and Khedub Jhe. On the entrance wall are pictures of Buddha Sakyamuni, Manjushri, Maitreya, Nagarjuna, Asanga and six great Indian Scholars. 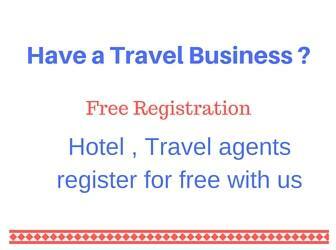 As you can visit different levels of the monastery you will get beautiful view of surrounding valleys and roads. The top floor gives a panoramic view of valley and roads passing by the side of the Monastery.